A far cry from the various bathing suits and bikinis we have today, the 1920s style suit was slightly more modest to say the least! Take your beachwear back in time with the 1920's Bathing Suit Costume for Women! 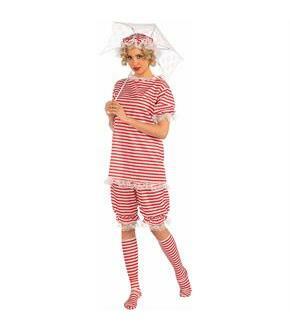 This blast from the past features a red and white striped short sleeve top with lace ruffle trim and matching bloomer shorts, bonnet and red striped socks that come right below the knee! This beach outfit seems a bit much for us now a days, but this was considered slightly scandalous! Imagine what people from that time would think about what we wear now!